Let The Colorful Tradition Spread Its Super Majesty Colorful- Multi colors used for forming vibrant space. Satin weaves- Get luxurious look to the bedding. Highly absorbent- You deserve sound sleep and we make it possible. High thread counts- Complement satin weaves and transform fabric texture. 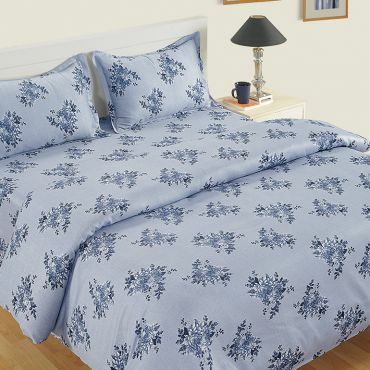 Feel The Touch of Blossoms Dipped into Ocean Satin weave- Transforms ordinary bedding into luxurious one. Pure cotton- Takes care of your comfort and hygiene. High thread counts- Silk look yet cotton comforting. Colorfast- Quality colors to enhance its durability. Wake Up Every Morning with Power to Fight Back with Daily Challenges Ultra-sheen- Super glossy look through high thread counts. Highly absorbent- Absorbs every single trash of moisture and sweat. High thread count (210 TC)- Intricate micro built of warp & weft for smooth texture. Pure cotton fabric- Supreme soft & pure hygienic for happy & healthy living. Enjoy The Double Fun with Fragrance of Blossoms and Plum Floral print- Turn living space lively with blossomy essence. Satin weave- Luxury serves you. High absorbent- Prevents germs by absorbing moisture and sweat. High thread counts- Micro weaving per inch for giving smooth and glossy texture. Create Soothing Aura into Your Bedroom Take yourself to top of the world of comfort & relaxation by bringing grey squares zinnia bed sheets. The soothing texture and the coordination of colors will define the elegance in beautiful way. The market is flooded with the different collections of bedding sets but the best satin bed sheets online in India is available at swayamindia.com. Embellish your Newly Furnished Home Add refreshing zeal to your bedding by bringing magenta graphic zinnia satin bed sheets. 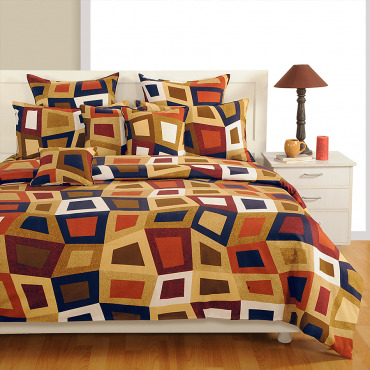 The innovative pattern gives a modern appeal to your bedding. The theme is placed smartly which create a sense of balance. Buy satin bed sheets online through shopping from swayamindia.com and present your home in the most elegant way. Create Rich and Traditional Look Renovate your bedroom by draping a silver motif zinnia collection on your bedding. Each and every detail is carefully printed to attain a flawless look; it will change the entire look of your space. 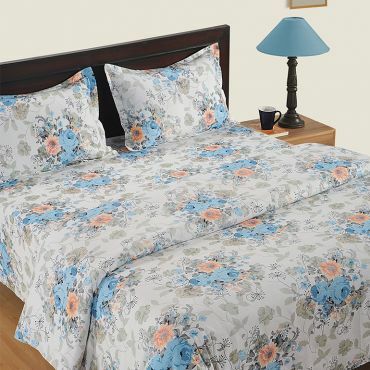 Buy silver motif zinnia bed sheets from swayam and refresh your home with positive vibes. Euphoric Linen for Your Room The bold ethnic motif arrested in the confines of equally striking circle patterns makes for an attractive look. Prints are inked in the most delectable mix of hot pink and vibrant yellow shades. It presents a lively look to your room. 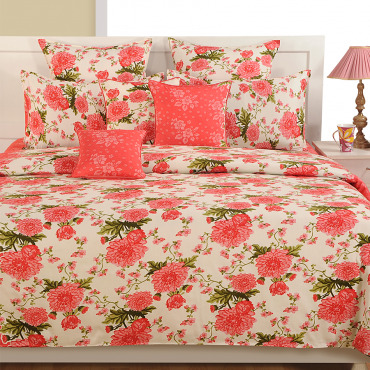 Buy rosy circlet satin bed sheets from Swayam’s Zinnia bed linen collection. Let’s Spread Royal Vibes to Transform Ordinary Space into A Regal Palace! Super Glossy- Shines like glitter and helps you to organize any function anytime. Highly absorbent- Say bye to moisture and sweat. High thread count (210 TC)- Butter smooth texture for soft feel. Pure cotton fabric- Prevents users against germs and allergy. Feel Most Relieved in The Floral Lap Floral print- Soothe not only eyes but also soul. Lustrous look- Woven through satin weaves for glossy look. Super soft touch- Pure cotton is used to let you feel like heaven. High thread counts- Touch butter smooth texture. Let The Roses Rule Your Bedding and See Their Elegant Majesty Colorfast print- Floral prints that don’t get faded away even wash after wash. Lustrous look- Shines through complex satin weave. Health-friendly- Pure cotton for absorbing moisture and preventing against germs. High thread count- Micro thread count built per inch for smooth fabric texture. Let Own Your Fashion and Feel Confident to Adorn It as Your Style Colorfast prints- Floral prints which are not faded even for long run. Super soft touch- Used pure quality cotton for creating most comfy bedding. Luxurious look- Royal look through satin weave and high thread counts. Hygienic space- Cotton stops germs’ accumulation by absorbing moisture. 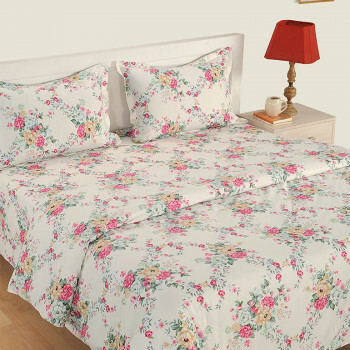 Redecorate Bedding with Bloomy Garland Satin weave- Adorn home with true luxury. High thread count- Super soft touch and butter smooth texture. Pure cotton- Heals your mind, body and souls with its natural properties. Highly absorbent- Absorbs moisture and creates hygienic atmosphere. Feel The Crunchy Caramel Through Choco Squares and Magical Motifs Pure cotton- Feel like in the lap of comfort & hygiene. Satin weave- Intricate weaving pattern for great lustrous look. Highly absorbent- Pure cotton for preventing users from germs and allergy. High thread counts- Advanced technology for creating smooth fabric texture. Create outstanding spaces Bring in a fresh look to your space with beautiful bed linens which are designed in a contemporary theme. A concept of weaving theme is incorporated in the designed in a combination of contrasting colors. Shades of green, olive, brown and orange are merged together to attain this beautiful design. Showcase The Elegance of Magical Motifs in Your Living Space Rich traditional design- Make your living space royal with rich ornaments. Ultra-Sheen- High threads counts per inch for radiant look. High thread counts- Feel butter flow texture. Highly absorbent- Pure cotton to absorb moisture for sound sleep. Think Beyond the Ordinary to Kick Off Royal Celebration Super glossy- Shines like a diamond. Pure cotton fabric- Enriched of natural properties to serve healthy living. Highly absorbent- No more germs and allergy. High thread count (210 TC)- Feel like petal soft. The bright crimson color gives a velvety look to your linen. The color coordinated floral further enhances the charm with a sophisticated look. The contrast white berries on right add a mystic look to its delicate presence. The classy velvet breezy satin bed sheet is available online at SwayamIndia. Transform the look of your home décor by introducing new and attractive things in your home. These things will impact your home in a stylish and sophistic way as they are beautiful designs following the latest trends. You will never have to be embarrassed about the look of your home when you cover your bed with these satin cotton bed sheets. Experience a blissful ambience around your abode by covering your beds with bright colors and elegant designs. Relax in tranquility and create a fascinating place for your eyes to enjoy. These bed sheets will turn your home into a place of style and elegance as they are made according to the modern trend..
Give your bed a chance to display its true colors and elegance by draping them with these fabulous bed sheets. Let a modern look emerge from your beds and spread the beauty to the entire house. Stay calm and comfortable in your bed and start a fresh day every day. Entry into the World of Luxury Give a royal touch to your bedroom with this classy dark dawn bed sheet. It is combined with the two colors, dark red and brown, which will give a posh look to your decor. Buy dark dawn satin bed sheets from swayamindia.com as it has a clear and graceful look that will add a classy dimension to the bedroom. 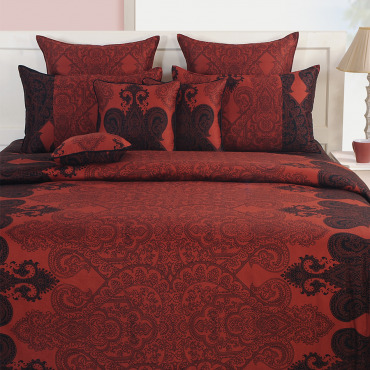 Feel the Royal Essence Create a modern space with artistic motif patterned bed linen set. 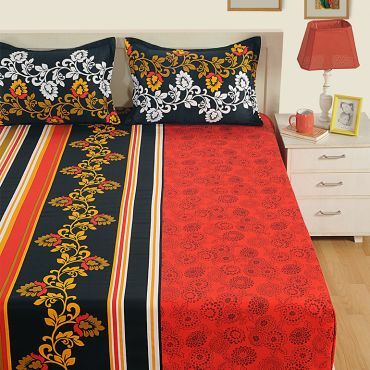 The black inked motifs are incarnated beatifically across the bed sheet. The contrasting flow of jet and light black exudes a royal grandeur look to your room. The gorgeous prints would surely attract your attention of your guests. Bring home this delightful royal satin bed sheets online India exclusively. 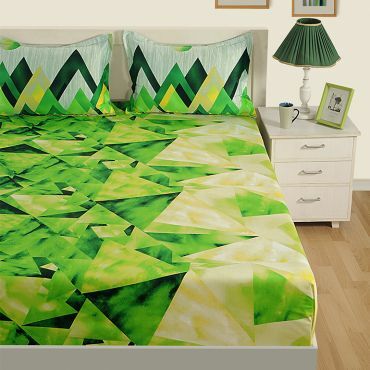 Spring fluorescent glow The bold and vibrant triangle prints are splashed right across every nook and corners of the bed sheet. The matching cushions, pillows, and comforters further glorify its beauty. The green color in combination with lemon shade presents a refreshing spring glow to your room decor. If you are having some problem merging your bed with your classy home décor, you need to cover your beds with this bed sheet. These bed sheets are especially designed to impart a fabulous look of elegance and sophistication. Buy damask red satin bed sheets from our online shopping portal swayamindia.com and give your home the ultimate transformation. Introduce the color black in your home decor and see your room emerge with a unique style. Transform your home to royal palace and feel the blissful ambience of the modern style. These satin cotton bed sheets will offer you more than just a comfortable surface to relax. Add wonderful colors in your space and see your bedroom from a different perspective. Give a royal look to your beds and feel rich. These beautiful bed sheets are combined with excellent colors and designs which will offer you a look of style and elegance. Mesmerizing Classy Speckles The primary speckle patterns are vivaciously spread across the cream color bed cover presenting a classy look to your bedroom. The scattered pattern helps you create a spacious look. The varied shade of blues used to ink the speckles makes for an attractive look. 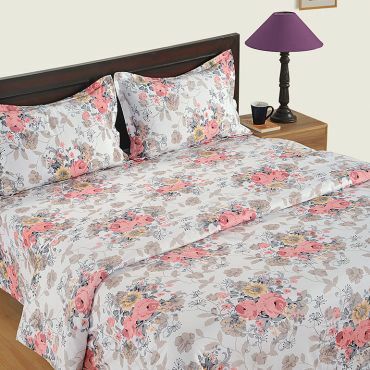 Get these satin bed sheets online in India and boost of a delectable set of print, colors and designs. Delectable Brownie Crush The bed linen is inscribed with hazel shade polka dots which help you add a serene look to your room. Similarly, the contrasting beige polka on brown backdrop presents a smart dapper look to your personal space. The cushion, pillow and other accessorize add to the serene beauty of the linen. Lively Cubics Wake up refreshed and rejuvenated every morning in the presence of lively and vivacious aura which you may own by purchasing satin cotton bed sheets online at swayamIndia.com. The creative trapeziums are uniformly scattered all across the length and breadth of the sheet. Not Only One or Two, Get Benefitted with Three Elements Satin weave- Drives most lustrous bed sheet. Premium cotton- Greets comfort and health in the home. High thread counts- Bring smooth texture onto the fabric. Health-friendly- Absorbs moisture and create hygiene. Make way for the ultimate solution for you bed. 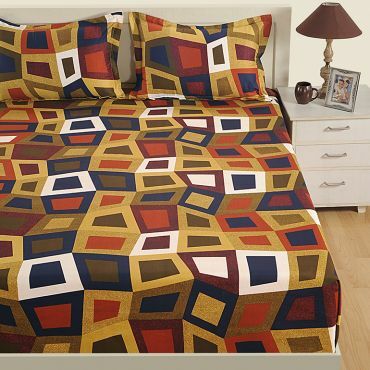 These bed sheets have exciting color combination and excellent prints which will transform the look of your space. They are designed by combining multiple prints together to attain one exclusive design. Make your bedroom the best place in your home by give them the look of modernity and elegance. 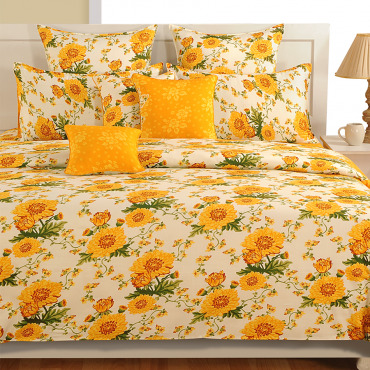 Hide the dullness and reveal the blissful colors in your bed by covering it with this beautiful bed sheet. Romantic Fuchsia Pink is a colour that never falls out of fashion. They create a lively romantic ambiance to the place where you impart it. It is especially true that you may enhance the interiors of your home with color pink. You may go for lighter tones like baby shades or intense like fuchsia. Sometimes even a small change can uplift the mood of room appreciably. You just need to pick the right accessory that pulls out a perfect look. Bed linen does much more beyond covering your mattress. It has the potential to make you feel more inviting and relaxed in the room. However, you need to make the right choice considering your budget, quality and style. We have come up with another beautiful collection to give you the taste of modern interiors at reasonable prices. Interesting thing about this range is it has the goodness of both satin and cotton. Yes, you heard it right; while satin lends the luxurious feel, cotton gives you a delightful sleep. You would be able to set an astounding ambiance with amazing designs and color contrasts we have used throughout these satin cotton bed sheets. You would notice patterns and style followed here are exclusive and interesting to see. 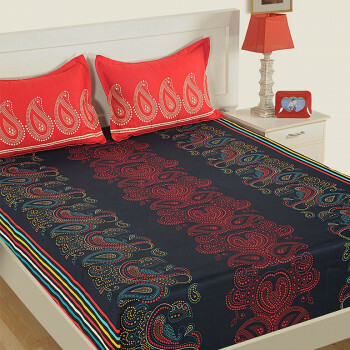 Buy zinnia collection bed sheets from swayamindia.com to fill your bedroom with sudden glamour and comfort. For your casual, sophisticated, elegant and urbane interiors, these bed sheets can play the perfect role. Some have subtle charm, some are loaded with vivid hues while satin cotton bed sheets are radiating with contemporary motifs to best suit every need.